Treatability studies are useful in the wastewater treatment process to help determine how wastewater might be properly managed, ensuring effective treatments are considered and/or implemented. These studies pinpoint which contaminants need to be removed in addition to narrowing down the ideal technological solutions. Here at SAMCO, we use the EPA treatability study guide as a basis for our treatability study development, but we also include extra steps to guarantee a thorough, effective study. Our method is a multitiered platform where the results from each tier are evaluated before moving to the next, adjusting the study as new information is learned. During the completion of Tier 1 of the treatability study, a sample of the raw process wastewater is submitted for analytical characterization and evaluation of the “substrates of interest.” During this step, the company performing the treatability study will also go on-site and spend a day (or longer) understanding the facility’s processes and problems. This is also the point in the process where resources available for a pilot study (including full-scale staff support) are evaluated. If the study needs to be performed on-site and they have no laboratory, the company performing the study should be able to provide a mobile/temporary version of the facilities needed, such as a lab and/or lab equipment. Once the scope of the problem is understood, technology screening and Tier 2 follow. If it is determined that the biological culture becomes inhibited or dies off, the wastewater may not be subject to biological treatment without additional pretreatment, and the study should move on to Tier 3 where a chemical treatability study is conducted. If it’s possible to determine that a similar wastewater has been successfully treated before, the technologies that haven’t shown promising results may be screened out in favor of the ones that have been successful. If these technologies are narrowed down and it is determined that a treatability study on a similar scenario has been completed already (meaning no treatability study is needed), the project can immediately go to “management decision factors,” where the water treatment experts and chemists decide what solution may be viable. If a treatability study is needed, then Tier 3a and 3b should be completed to determine the viable technologies. During Tier 3a, a screening of traditional chemical treatments, redox mechanisms, and advanced oxidation processes, respectively, are performed. In other words, this is where the effects of different chemical treatments when mixed with the wastewater are evaluated. At this point in the process, chemicals that show a positive reaction can be categorized as a possible solution, and ones that don’t can be screened out. Now that the possible technologies are selected, it is a good idea to test if they meet the performance goals. If not, the technologies should be screened out, but if they do, a detailed analysis of each should be performed. Once it is determined the performance goals are met, the pilot study can be developed and the components of a full-scale system design considered. If the selected technologies don’t meet the performance goals, jumping to Tier 5 should follow, which is a more advanced treatability study. This is only done when all the testing previously performed isn’t yielding the desired results. 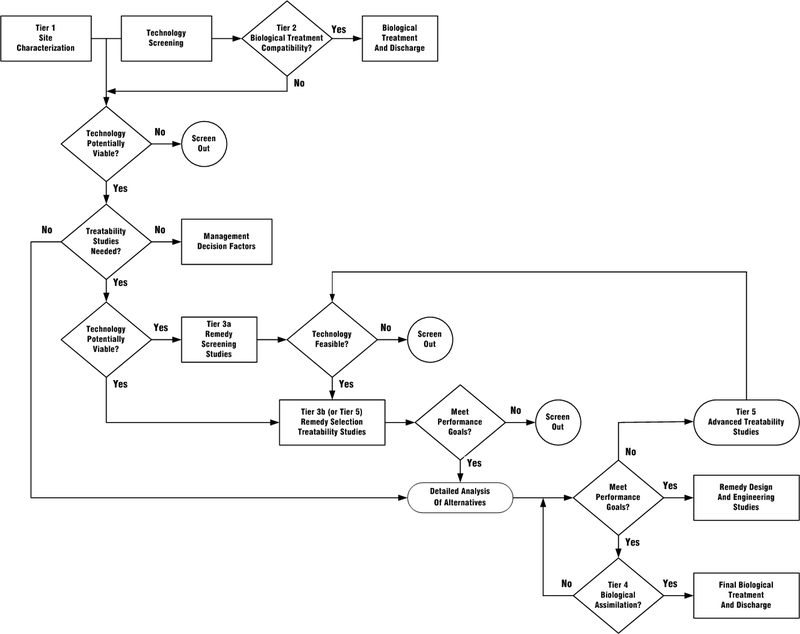 The company performing the study would then need to loop back to earlier steps (Remedy Selection), perhaps introducing a second or third chemical product working in a synergistic manner, then proceeding through the rest of the flow chart. Once all the performance goals are met, biological assimilation tests should be performed to assure the wastewater transformation is compatible with existing downstream systems. (When one wastewater problem is solved, there is a possibility another has been created, and this step will account for it.) 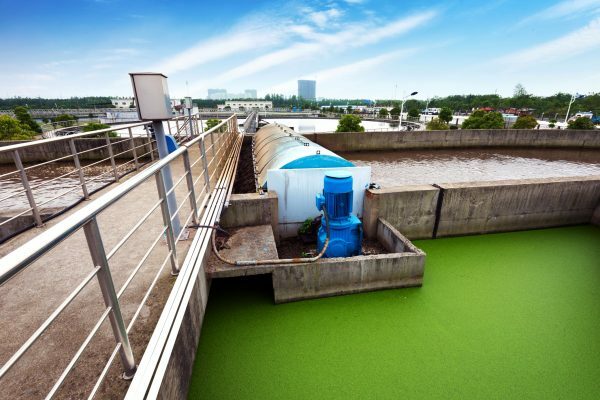 The resulting pretreated wastewater may be subjected to further biological polishing in a downstream on‑site wastewater treatment plant, or perhaps discharged to a local sewer and municipal publicly owned treatment works (POTW). This procedure is similar to Tier 2, which helps determine if the wastewater is now compatible with biological polishing. Once the performance goals are met and final biological treatment is successful, the system can be designed and implemented. If the previously selected technologies are not yielding desirable results, additional conditioning of the wastewater may be needed to improve performance and achieve the final objectives. There is no better way of ensuring that a system can meet your facility’s needs than to test treatability in a laboratory and support those results with a pilot study. With over 40 years’ experience, SAMCO can help analyze representative samples of your process stream and evaluate the best available technology for your custom solution with on-site wastewater sampling, testing, and analysis. SAMCO can also assist your facility in meeting State/National Pollutant Discharge Elimination System (SPDES & NPDES) and Industrial User/Significant Industrial User (IU & SIU) permits.